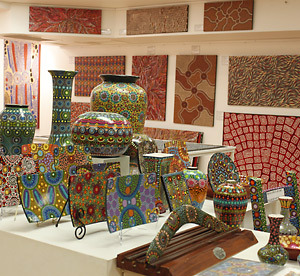 Spi rit Gallery was established in 2002 as a small Aboriginal art & crafts store at the Rocks Centre in the heart of historic Rocks area of Sydney Australia. It has since grown to become Sydney’s premier location for Aboriginal arts and crafts with an emphasis on instrument quality didgeridoos. Conveniently located for locals, interstate and international visitors, Spirit Gallery is a must see when visiting the Rocks. In 2007 we moved to our new larger premises in the existing Rocks Centre allowing us to showcase a bigger selection of works in an open 200 square metre area. The gallery focuses on affordable arts & crafts representing several Aboriginal owned and operated community art centres in addition to many traditional and contemporary Aboriginal artists. Aboriginal crafts such as carvings, boomerangs ceramics, glassware basket weaving and bark paintings can also be found. The large space also allowed us to create a “didgeridoo store” inside a store and has become a real speciality and passion for us. After many years of establishing relationships and scanning the country for every reputable maker Spirit Gallery now showcases the countries top instrument makers all under the one roof. Names such as Nathan Burton, Bruce Rogers, Kristian Benton and IDIJ Yidaki which are synonymous with quality didgeridoos are found exclusively at Spirit Gallery. 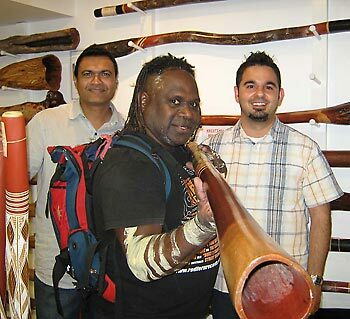 Spirit Gallery has grown to become the local hub for didgeridoo players and is frequently visited by some of the best known didge players in Australia and abroad. Being the only recognised speciality didgeridoo store in Sydney, all our instruments are meticulously hand picked for their sound quality workmanship and tonal qualities. Experienced didgeridoo playing staff are always available to help with all things didgeridoo with an extensive range of accessories and instructional material also available.